Obstruction of ear canals in an American Cocker Spaniel successfully treated using a video otoscope. The third screening strategy consisted of both the tone-emitting otoscope and the hearing handicap questionnaire. It takes motor skills and cognition to remove the otoscope from its holder. Viewing the horizontal ear canal and advancing the otoscope was easier in breeds like Labrador retriever and Great dane owing to their wider ear canal. 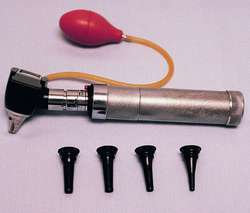 Also there is a version of an otoscope called a Macro View (Welch Allyn, Skaneateles Falls, N.
The only reliable method to diagnose an ear infection is with an otoscope to examine the ear drum to determine if it's red. In most cases, otologists evaluate size, shape, and site by simply looking through a handheld otoscope. Ingrams in Trinity Street in the city centre has a video otoscope, which allows people to see their eardrum and the passage leading from it on a screen. Chance to peep into your own ears . . Most of the icons are straightforward, eg, the otoscope looks like an otoscope. Abra la boca,'' he said as he pointed an otoscope into her mouth, then her ears and nose. Video otoscopy is the use of an otoscope that has a very tiny video camera that transmits images to a television screen.